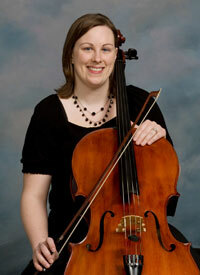 Amanda Nelson started cello studies with Stan Smith when she was seven years old. She was his first cello student and the first cellist to be part of the Aurora Suzuki Violin Program. Before entering high school, Amanda changed teachers and began lessons with Linc Smelser. While in high school at West Aurora, she played cello in the Northern Illinois University Community School of the Arts (CSA) Youth Sinfonia and in her high school orchestra, which she helped start. She also began learning upright and electric bass to play in the band and the jazz band. Amanda graduated from Augustana College in Rock Island, IL, in 2005 with a B.A. in music education. During her time there, she played both cello and string bass in the Augustana Orchestra. She was the cellist in the Senior Quartet and she also played string bass in Augustana’s concert band and jazz combo. She spent a term abroad studying literature, history, and music in Vienna, Austria, which was quickly followed by a month-long trip throughout China where she studied Chinese music and culture. She currently is an orchestra teacher at Dundee Middle School in Dundee, IL where she directs the 6th-, 7th-, and 8th-grade orchestras and the DMS Honors Orchestra. She also teaches private lessons to cello and bass students, serves regularly on her church’s worship team, and plays electric cello in the Tom Sharpe World Music Ensemble. For the past 6 summers, Amanda has directed a summer music program called The Garage Orchestra. The Garage Orchestra is a string orchestra made up of about 60 middle- and high-school orchestra students (complete with drums, electric bass, and guitar). They play all rock music and literally rehearse in Amanda’s garage. Amanda has played cello with the Kishwaukee Symphony Orchestra since 2005 and has served as the orchestra’s general manager since 2006. In 2013, her service as general manager was recognized by the Illinois Council of Orchestras, which named her as the only recipient in the state of an Honorable Mention as a person who has made outstanding contributions to an orchestra within Illinois.